Hans Hess could not find the burger he dreamed of, so back in 2002 he decide to make his own. By 2005, the first Elevation Burger opened in the States. 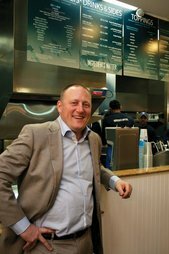 In 2009, TABCo picked up on Elevation Burger’s innovative concept and fell in love with the organically delicious burgers. We knew we had to bring those organically delicious burgers with us to the region… and we did! Our burgers are made of beef that is 100% USDA-certified organic, 100% grass-fed,100% free-range, ground on premises, and 100% halal. Which means our cows are never given antibiotics and are free of pesticides and other chemicals. Our cows are not raised on grains like most other cows, which results in beef that contains higher levels of healthy fatty-acids (Omega 3’s) and less saturated fat. Our fries are always freshly cut on and cooked in 100% Heart Healthy Olive Oil! The terms we use, “organic”, “grass-fed”, “free-range” and the burgers we design, have real meanings and real impact on your health, and the way the food tastes. Our burgers have an appropriately sized bun that does not compete with the meat. And the meat has true flavor and benefit, unlike the mass produced, corn-fed beef others use. 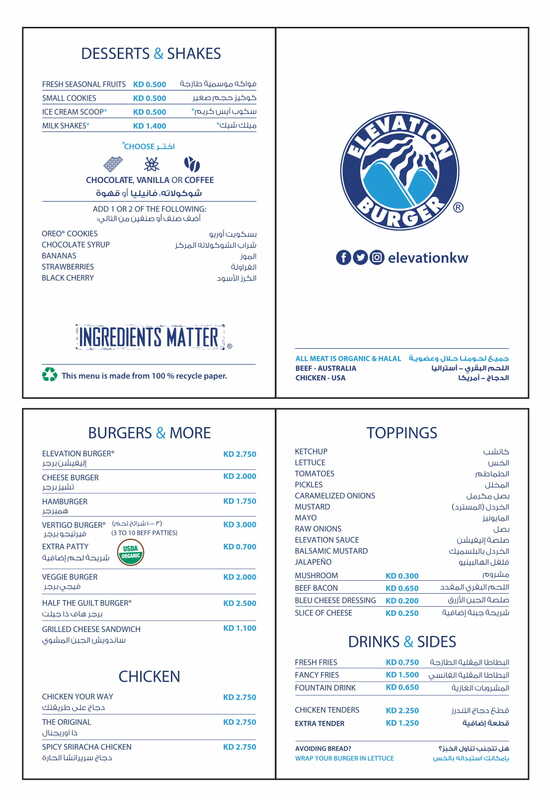 Elevation Burger follows a sustainable approach that puts people, product and the environment ahead of profit. We are committed to providing an enjoyable dining experience in a setting that adheres to LEED standards, a rare approach in the restaurant industry. We are committed to using environmentally sustainable finishes, equipment, construction and operating practices, from Energy Star-rated appliances and LED lighting to renewable bamboo flooring and compressed sorghum tabletops. Enjoy our signature burger, or make up your own from our wide selection of fresh toppings and 100% USDA certified organic, grass-fed, halal beef burgers. Enjoy our organically delicious burgers in our environmentally friendly stores. Click below to find an Elevation Burger store that is closest to you. See you there!